Late on Friday night Martin Boon was driving Mr Sampson & Mr Flynn to the Horse & Groom. The cart was overturned in consequence of a heap of manure left in Caxton Road. It was too dark to see the pile, and no light was given of the danger. Mr Sampson received very serious injuries to his head, but he managed to walk to his house a short distance away. He was covered in blood and Mr Aldous the surgeon was called for assistance. Image & added history thanks to Paul Griffiths, Peter Boon & George Boon. 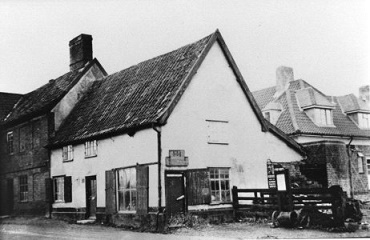 c1934/5 - The original house is seen at extreme left. The central building is the Saddle Makers. 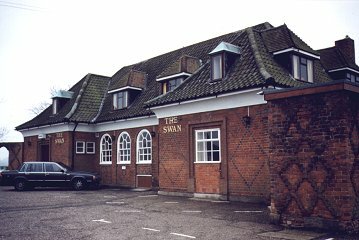 The new Swan is behind, nearing completion. Image thanks to Peter Boon, via Paul Griffiths. Lot No. 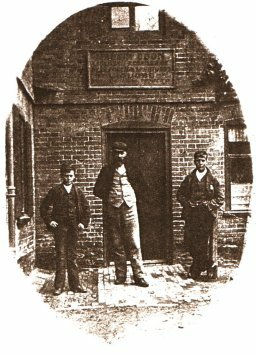 4 in the sale of the Geldeston Brewery Wednesday 1st April 1858. Purchased by Youngs for £610.